Oblong Industries has announced the results of a commissioned Forrester Total Economic Impact Study that projects Mezzanine customer payback in 7.6 months and 226 percent ROI. "While it's easy to understand how Mezzanine's Infopresence capabilities amplify all aspects of collaboration, it's more difficult for organizations to quantify these benefits in monetary terms,” said Oblong VP of marketing Lilian Bories. “That's why we commissioned Forrester Consulting to conduct a Total Economic Impact (TEI) study examining the value that Oblong customers realize by implementing Mezzanine." To quantify the complete value, Forrester's primary research with Oblong customers was distilled into a hypothetical composite organization (CO), which is a global company with $2.5 billion in annual revenue and 1,000 employees. CO implemented Mezzanine for both external sales and internal collaboration workflows. 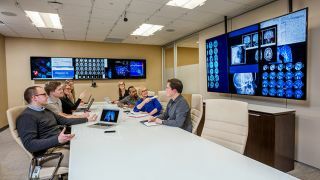 Prior to Mezzanine, CO relied on face-to-face meetings and traditional collaboration tools (such as presentations, phone, and web/videoconferencing). Forrester's analysis focused on the following paths to Mezzanine ROI: improved internal workflow and collaboration; positive impact on won/closed sales opportunities; reduced time spent advancing qualified sales opportunities; and higher-level customer service delivery using Mezzanine. The top efficiencies that contributed to the rapid payback and ROI were $1.6 million saved from improved business processes and 15 percent improvement in rate of closed and won opportunities. "These findings are the result of in-depth analysis," Bories said. "But we realize your organization will be somewhat different than the composite organization CO. Thus we strongly encourage you to use the same framework to analyze the benefits your organization will experience using Mezzanine." Oblong's customers include NASA, PwC, IBM, Fujitsu, and Accenture, along with other Fortune 500 companies.